Special discount for TWC members! In this haunting love story set in New York in 1919, novelist Franklin Woolsey (Steve LaRocque) dies mid-sentence, but his typist, Myra (Carol Spring), continues to take dictation. Attacked by skeptics, the press, and Woolsey’s jealous widow (Stephanie Mumford), Myra sets out to prove she is more than just an artful forger. Is she trying to steal Woolsey’s legacy now that she cannot have his love, or might she truly possess a gift the world can’t understand? Be sure to join the director and cast for a special talk back with the playwright, Michael Hollinger, on Sunday, April 14! Ghost-Writer will be directed by Laura Giannarelli, a founding member of the highly acclaimed Washington Stage Guild. Previously at QTC, Laura directed Faith Healer and A Lesson from Aloes. 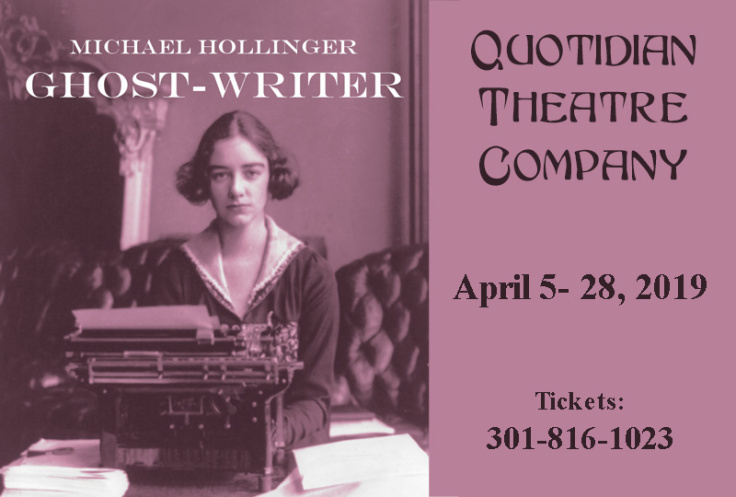 ALL PERFORMANCES at The Writer’s Center, 4508 Walsh St, Bethesda, MD. Prized by its patrons for its intimate stagings, QTC specializes in productions of naturalistic plays about the truth and beauty in everyday or “quotidian” life. This boutique theater caters to those who enjoy pondering–and discussing with friends after the show–the meaning of a great play. Located within walking distance of Bethesda’s renowned restaurant district, there are plenty of fine dining establishments at which to eat and drink before or after the play. On Saturdays and Sundays, parking is free in the public lot directly across from the Writer’s Center, where QTC is the resident theater company. QTC is easily accessible by car or Metro (red line to Bethesda stop).